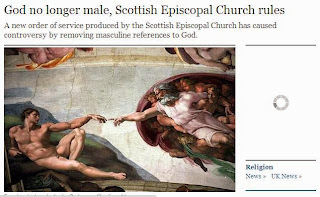 "The new form of worship, which removes words such as "Lord, he, his, him" and "mankind" from services, has been written by the church in an attempt to acknowledge that God is "beyond human gender". The controversial changes were discussed at the church's General Synod recently. The minutes of the synod reveal that female priests had asked why God was still referred to as a man." Now if this doesn't show you how domesticated Western society has become under this anti-male agenda nothing will.